What Is Health: If Marcello Can Do It, Then So Can You! One of the most inspirational things about the “Shrink Team Challenge” is the stories of success. This week, I’m featuring the success of Marcello Lisi. 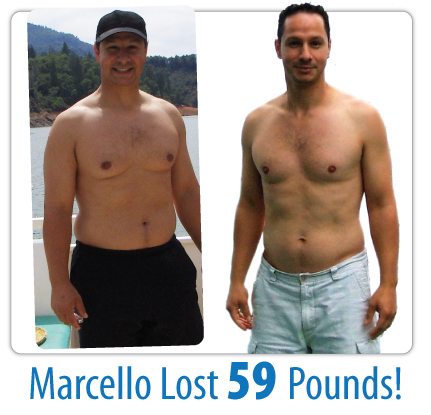 Marcello Lisi - Lost 59 Pounds! I lost 59lbs in 8 months and have kept it off for 4 years and counting. The Shrink Team Challenge was the answer. I realized in late 2006 that I was overweight after having seen a picture of myself without a shirt on and really didn't like what I saw. I really didn't know how I was going to lose this weight until a friend of mine introduced me to a cookie that would help control my appetite. To my surprise the cookie was delicious. So I decided to take the Shrink Team Challenge and started eating my cookie and replacing my lunch with a shake. The great thing is that I never felt like I was depriving myself or dieting. I felt full, and in 8 short months I had lost 59lbs. It has now been 4 years and the weight never came back. Every day I continue to eat my delicious cookie and replace my lunch with an amazing shake. The great thing is that I get to chose between an Oatmeal Raisin or Chocolate Chip cookie and a Vanilla, Strawberry or Chocolate shake. I have a choice and it's awesome! Thank you Shrink Team Challenge.